← Martens and Mountains, Unexpected Adventure. My morning coffee routine when I’m at home includes pouring over the daily satellite data and watching the ice processes at the poles. 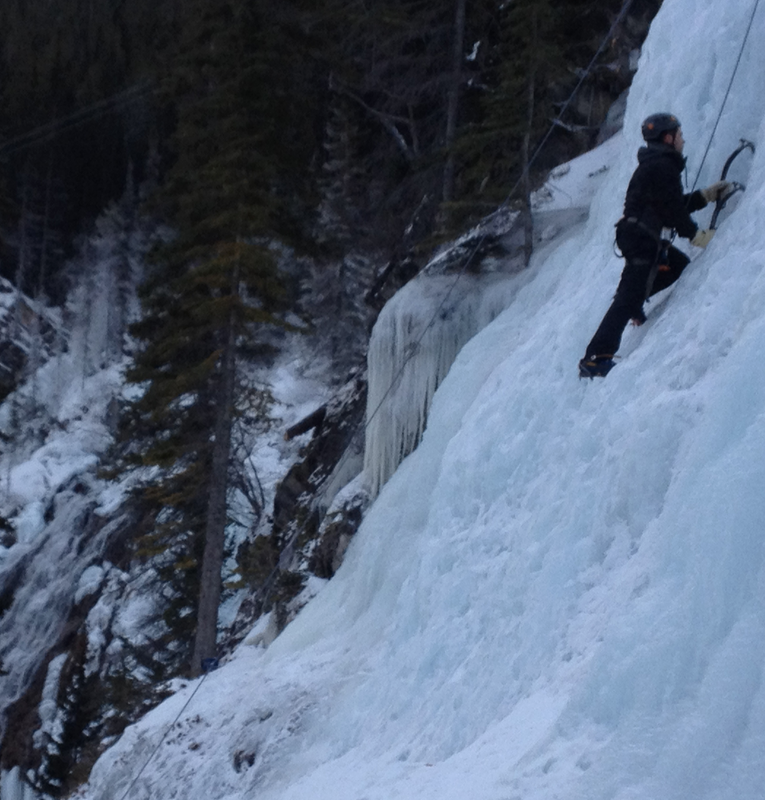 So I guess it was only natural I would end up trying ice climbing. 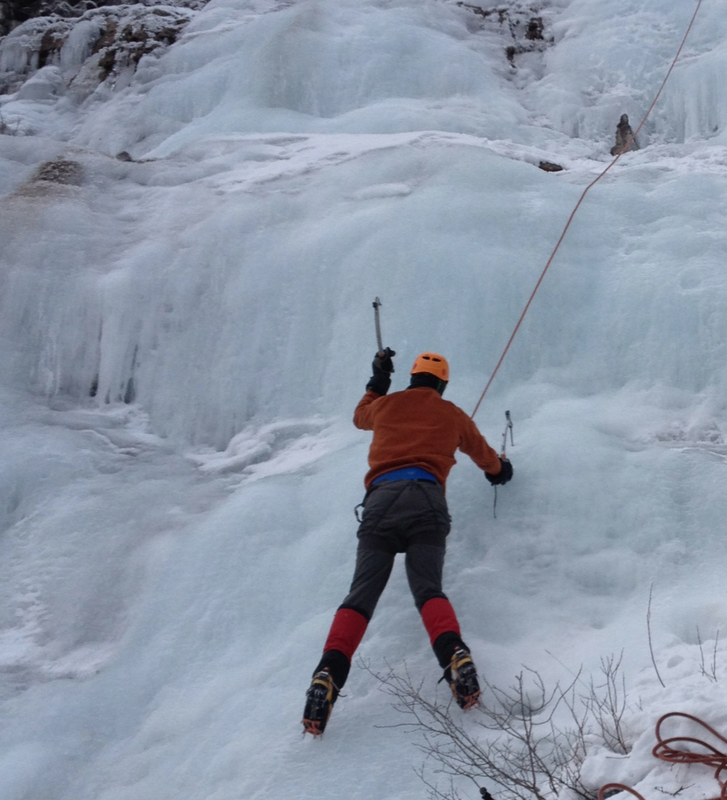 Previously, I have found climbing even short bits of ice a little unsettling. This fall while on a course in the Columbia Icefields, I learned some rudimentary techniques which improved my confidence. I’ve seen people climbing frozen waterfalls with ice shards cascading down from their axes and it all looked very dangerous and precarious! In my inbox a few weeks ago though, I got a message from the Mountain Skills Academy offering me a discount rate to fill any last minute opening on their 2 day ice climbing course. I put myself on the list and lo and behold I got in. 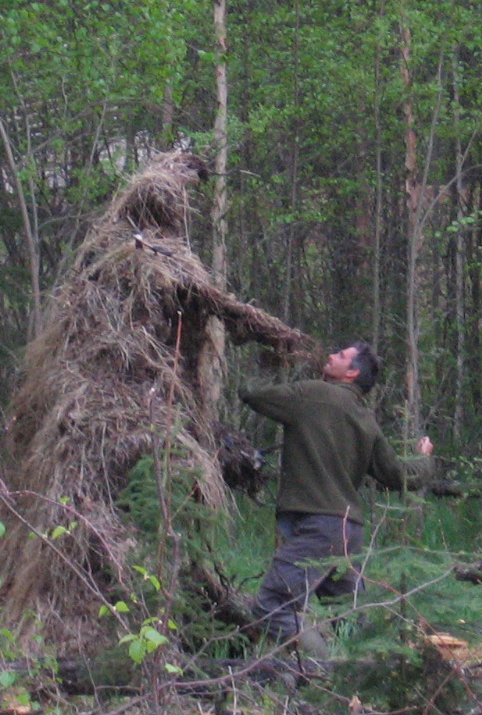 It seemed scary but I thought I would at least try it. Banff and Norway are the two biggest spots in the world for climbing frozen waterfalls so it would be silly to not try. Day one was dedicated to learning proper climbing techniques while day 2 focused on learning how to build proper anchors, belaying, repelling, and leading. Above: Me climbing up the upper falls. Nino stands on a secure ledge ready to brake the rope if I slip. When you first throw the ice axes into the ice, it shatters and breaks off leaving you quite nervous. This is known as “dinner plating.” But when you feel it go into a solid hold, you really can trust it. Something I never felt when watching others do this. The front points of the crampon also get a hold that you can really feel when it’s secure. To go up with confidence was all about not committing to anything until I got that good “bombproof” hold. Then the climb becomes a geometry problem. The instructors constantly improved our form and corrected our body positions. I had some difficulty extending my left arm straight up due to its reduced mobility, but I made out okay. Above: While taking a rest on a ledge, I snapped this pic of my classmate Jordan climbing beside me. In the lower background you can see the main flow of the falls roaring unfrozen. Above: Dealing with reduced dexterity with the left hand. Some hikers past underneath us and stopped to watch for a while so I asked if they could snap this picture with my cellphone. 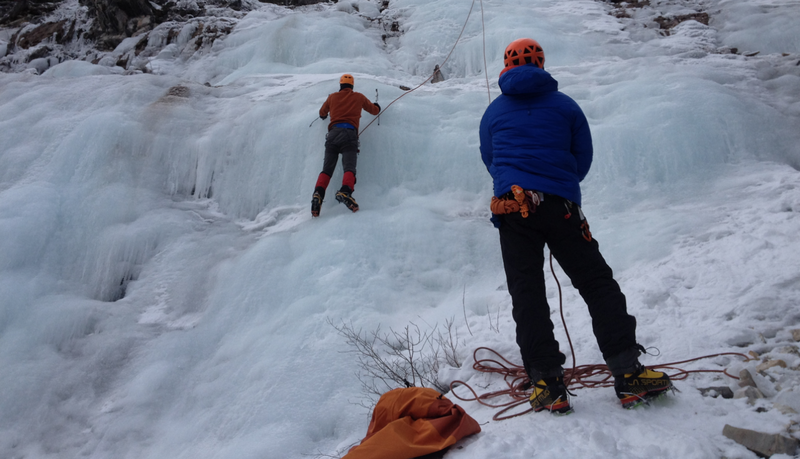 I had taken this course to learn some technical skills and ice anchor construction so I was surprised when it was over to discover I really enjoyed Waterfall climbing for its own sake. For a second, it can feel like everything in the world but you has stopped in a moment of time. It’s also an opportunity to really see up close something that you could only ever see from a distance. The textures and morphology was fascinating. Another good winter activity for when the skiing is not as good!